Tamluk: Enraged by sprinkling of colours on Holi against his wish, a 55-year-old farmer with a sickle in the hand allegedly chased a group of boys, caught one of them and hacked his left arm at Digha in East Midnapore on Thursday. The alleged attacker, Prabodh Dutta, is on the run. Police have registered an "attempt to murder" case against the farmer on the basis of a complaint lodged by the boy's father, Manindra Barik. Dutta was working in the garden when the boys arrived and sprinkled colours on him. "We had been playing with colours mixed with water from around 8am. I, along with my friends, were spraying coloured water on passers-by with our pichkaris (water guns). We noticed that Prabodh dadu was erecting a bamboo fence in front of his home. When we went forward and sprayed colours on him, he became furious," said Arijit. "He picked up a sickle and chased us. My friends ran away but I stumbled. He caught me and hit my left arm with the sickle heavily," added the boy. Arijit, a Class V student, was released from a Digha hospital after the arm was stitched and bandaged near the elbow. Sandip Das, Arijit's classmate who was part of the young sprinkler brigade, said when Prabodh had seen them approaching with the pichkaris, he had asked them not to go near him. "But we could not imagine that he would become so furious and hack my friend just because we sprayed colours on the day of Holi," said Sandip. Arijit's father, a hawker on the Digha beach, said Prabodh would get irritated easily. "We have noticed that he gets angry if children enter the small garden he maintains in front of his house. Sometimes, he even takes the trouble of going to the children's homes to complain. But this is too much. I find it difficult to accept that he hit my son's arm with a sickle just because he and his friends sprinkled colours on him," said Manindra Barik. Following the attack, residents of Paya village stopped the Holi celebration and called off a cultural programmed scheduled for Thursday evening. Officer-in-charge of Digha police station, Basuki Banerjee, said: "We have launched a search for the accused person. We hope to arrest him soon." 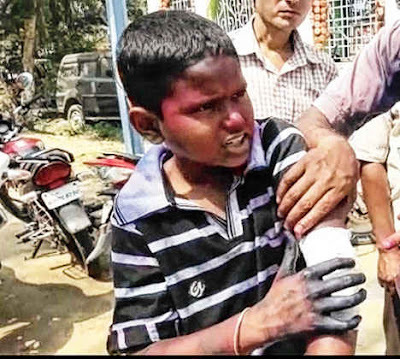 Enraged by sprinkling of colours on Holi against his wish, a 55-year-old farmer with a sickle in the hand allegedly chased a group of boys, caught one of them and hacked his left arm at Digha in East Midnapore on Thursday.